AKC began in the early 1970s. The firm underwent several evolutions in the following years and in 1976 the late Emerick Knowles, QC, joined Emanuel M. Alexiou in the partnership, followed shortly thereafter by E. Terry North. Over the decades, the firm has grown and evolved with the changing times, and has become an established contender in the modern legal landscape. In 2010, Emerick Knowles passed away unexpectedly while competing in a cycling race to raise funds for cancer research. As one of the early members of the firm, and a brilliant litigator, he was instrumental in placing the firm on the map. He has left an enduring legacy on which we continue to build. 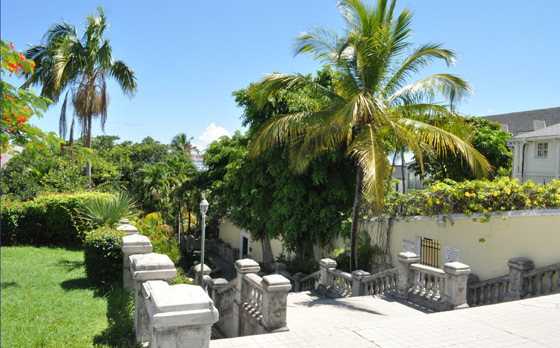 AKC is located in a historic building at the top of the Frederick Street Steps on East Hill Street, overlooking Nassau Harbour. The house, originally called “Hill Crest”, was the home of the Moseley family. It was built in 1840 by Edwin Charles Moseley, who founded The Nassau Guardian newspaper in 1844. 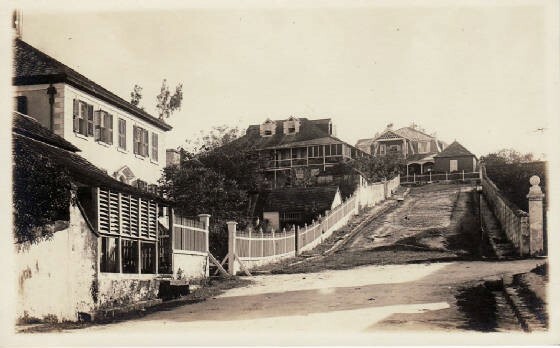 The picture below shows the home (middle building just to the left of the slope) before the Frederick Street Steps were built. The house was built into the ridge where East Hill Street is now. It was constructed out of blocks cut from the limestone rock which were excavated at the site. Mr. Moseley came to the Bahamas from England in 1837. It was at Hill Crest that the Nassau Guardian was produced and printed for many years. Mr. Moseley’s son Alfred Moseley assumed responsibility for the newspaper in 1887, and his daughter, Mary Moseley followed suit, acting as editor of the newspaper from 1904 until 1952. After the death of Mrs. Valeria Moseley, Alfred’s wife, the East Hill Street home was sold to Mr. Glen Stewart, a prominent winter visitor. Mr. Stewart had the house completely renovated, most noticeably removing the old wooden verandahs. AKC has been at Hill Crest since the firm began. This may not have been a typical choice for a law firm, as the building was built as a residence complete with fireplaces, ensuite bathrooms and wood floors throughout. However, with some adjustments, it has become a comfortable office space, and the building’s character and charm are now an integral part of the firm’s personality. In 2003, to accommodate the growth of the firm, AKC constructed a new building on the property. Great care was taken during this renovation to preserve the integrity of the old home both structurally, and aesthetically. The end result is that the new building sits unobtrusively along the length of the eastern boundary of the property, separate from the old residence and the historic character of the property has remained remarkably intact. In an interesting twist of fate, Mr. Alexiou and one of his business partners purchased The Nassau Guardian, making it once again a Bahamian owned newspaper and bringing the ownership full circle back to the Moseley house where the newspaper was originally printed in what is now our conference room.